Hated it when clothes would get wrapped aroung one of the wringers. Besides the wringers, who can forget the the double wash tubs for rinsing, the bottle of laundry blueing, and the stick for poking /pushing the clothes in the tub? Fond memories of helping my mom. My mom also did not switch to a New and Modern Machine until 1980. Really the only thing I despised about it was your shirt/coat sleeves getting soaked as you retrieved the clean laundry from the rinse tub. This was fine in the summer when you went into a hot environment outside anyway. But in the winter, BRRR! Rivvy, are you sure it wasn't your head that went through that wringer? Jeez, now I've done exactly wrong and brought you all down! Do not go there! We're okay! Peace and joy is our birthright! my point! no matter what, we are made of infinite love! Take it from me! Now what's your favorite joke, everybody? Mine, at the momoent is one dog says to the other dog, "I'm not sure, but I think my name is Downboy" Come on? Ummm, Rivvy? Your post must have made sense to you when you wrote it. But, reading it now, does it still do so? I must admit to being somewhat lost. I guess this product gave birth to the phrase "put him through the wringer". Yup, Mom had a Maytag. I remember it had a big red "button", which I think was used to drain the tank. The laundry room at the summer camp I attended in 1963 (Camp Hurley, near Kingston, NY) used these. My grandmother used one of these, then my aunt ended up with it...I remember having to drain the water and taking it outside to dump it. My grandmother had this, too. 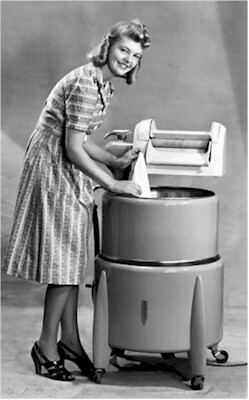 She washed her clothes with it and never changed - she died in 1980. Lord knows how much laundry went through the wringers!